It might be surprising for you to learn that the career of a freelance writer can easily get you more than 20,000 INR per month. If you are considering to spend 3–4 hours a day, then this is absolutely possible! Let me tell you how you can earn approximately 1K per day just by writing a couple of articles from home. Today, Content writing has become a mainstream profession. The increasing demand for good writers has opened up a whole new job avenue for freelance writers. 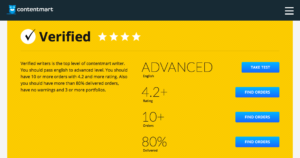 Contentmart is a platform that connects clients from all around the world with freelance writers. 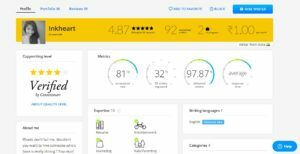 The client’s post projects on Contentmart. After which, the client chooses one writer among all the bids. Once you’ve been chosen, you can finish the project and get paid. How much will I be earning per article? Pay per article differs from client to client. However, On an average, you will be getting at least 300 INR for a 500 words article. Clients who pay in dollars generally pay $5-8 for a 500 words article. This is not a fixed rate, hence there are clients who pay more and some who pay less. If you manage to write at least 3 articles everyday, then you can easily make around 1000 INR per day. This implies that you can earn around 26,400 INR by writing 4 articles everyday — even after taking your weekends off. Once you improve your credibility as an experienced writer your earnings per article is simply going to increase. Note: Keep in mind that 300 INR/ article is the just the basic rate. There are orders which can earn you up to 500 INR/ article. So once you start gathering experience you can easily win bids on higher paying orders. How many hours do I have to write per day? As a seasoned writer, you wouldn’t need more than 2–3 hours to write 3 articles. If you are a starter then you might need to devote around 4–5 hours every day to complete 3 articles. When and how can I receive payments? After your project gets accepted, the amount gets credited to your contentmart account. You can later transfer it to your bank account as soon as the balance in your contentmart account reaches 3000Rs or more. Can anyone write on Contentmart? YES! If your vocabulary is good and grammar is strong then it shouldn’t be difficult for you to land up with writing projects on Contentmart. 2. Click on register as a copywriter. 3. Enter your details and sign up. 4. Start bidding on projects. How can I increase my chances of winning a bid? The first thing you need to do is start building a good profile! Because this is what helps the client in deciding — Whom he should hire? So, it’s really important to build an attractive profile. So, let us take a look at how you can create a stunning profile on Contentmart. After signing up as a writer on the site the first thing you’d need to do is fill up the basic details about yourself. The ‘About Me’ section is extremely important since this is the first thing — the client is going to check. Make sure to write about all your achievements, skills, and experiences in a short and crisp paragraph. Try not to get into too many details as the clients will not have the time to go through it. This makes it easy for the client to know that — You’re an expert of a topic/field, which actually increases the chance for you to get hired! So, specify the kind of topics that you’re passionate about writing and possess a great knowledge & experience in the field. On Contentmart you will be able to create your portfolio by adding projects, you’ve done before. This is a very crucial aspect of your profile since this is where the clients are going to look at, before hiring you. Make sure to include only the very best works in your portfolio. Do check your articles for any grammatical mistakes before uploading them. Add at least 4–5 solid articles on your portfolio so as to be viewed favourably, by any client. Giving a face to your profile is of utmost importance since no one will be willing to work with a writer (without a face). Make sure to upload a professional picture if you want to be taken seriously by your clients. You need to sit for a short grammar test to qualify for writing. The test will be a set of multiple choice questions which you need to answer. The first test will be very basic! You’ll then have many other tests to get to an Advanced English Certification. This will make the client know, that you’re really good in grammar. Now that your profile is complete its time for you to secure your first contract on Contentmart. Getting projects on Contentmart isn’t as hard as you imagine. All you need to do is click on the ‘All Orders’ button, browse through the job list and bid on them. 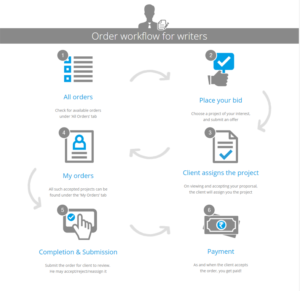 You need to submit a proposal to the client by bidding on the orders placed by them. Click on the ‘Bid on order’ button below the job and write an original proposal describing why you are the right candidate for the order. While bidding on the order make sure to check the deadline. If you don’t think you will be able to complete it before the deadline then don’t go for it! You are also allowed to suggest your own price along with your preferred deadline which might or might not be accepted by the client. However, there is no harm in suggesting. Don’t lose heart! If your first few proposals get unanswered. It takes some time to build up credibility on a competitive site like Contentmart. Try not to be very choosy about your first project. Keep bidding on all the orders and you’d surely land up with a job or two. Becoming a verified writer on Contentmart can immensely help you in landing up with a lot of projects. In order to get verified the first thing you need is to pass the Advanced English test. Apart from that, you need to successfully complete 10 orders and get an average rating of 4 stars or more. So make sure to request your clients to provide you with a glowing review and rating while you submit the order. It goes without saying that verified writers on Contentmart are more likely to get selected by the clients. Once you have received your first job you are on your way to make a steady income just by sitting home with your laptop. You don’t need to be an expert on the given topic to write an article about it. You just need to follow the steps given below to come up with an excellent article. 3. Get a grasp of what the topic is about! 5. Make sure not to copy anything from any existing article or else your work would be plagiarized and the client will give you a bad review. 6. Submit the article and wait for the client to accept it. After receiving your article your client will do any of the following- accept the project, reassign the project or request some minor changes. 7. Promptly respond to your client’s request and resubmit if needed. 8. Once your project has been accepted by the client, your fees will get deposited in your Contentmart account. 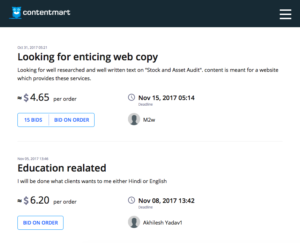 Keep in mind that your article has to pass the plagiarism test on Contentmart before you will be able to submit it to your client. This means your content must be original. In case your article is copied, then it would automatically be cancelled. So make sure not to lift a single phrase from any other existing article. That’s it! This is how you can start your journey on ContentMart. I hope that this article, guides you in earning 20,000 INR per month. If you have any doubts, let me know in the comments section below.